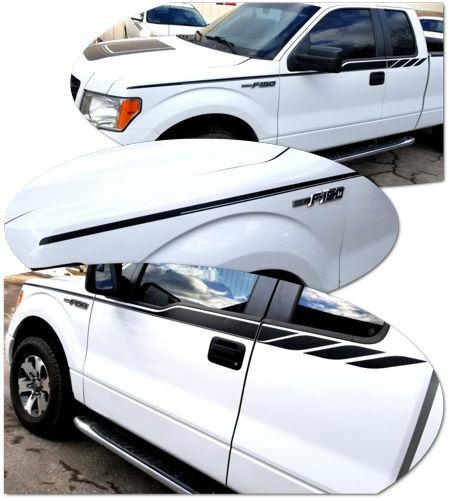 Set your '04-'14 Ford F-150 apart from the rest with this unique Body Side Graphic Kit. This easy-to-install kit is packaged as a set of precut pieces - ready to apply - in a wide variety of colors. Designed to be placed along the F-150's distinct body lines as shown on the image, kit is available for vehicle models as noted in the Graphic Application Chart below. Front Fender pieces are designed specifically for ‘09-’14 model vehicles. Pieces will fit ‘04-’08 model with slight adjusting and trimming at Fender front or door jamb areas. Kits are specifically designed for SuperCab or SuperCrew model vehicles. Kits will fit Regular Cab model with slight trimming at door jambs and cab/box connection.